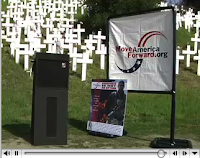 On March 8th the pro-war group, Move America Forward (MAF), staged a rally at the Lafayette Hillside Iraq War memorial that was built and is maintained by anti-war activists. MAF awful group with horrible credentials. Read about them at sourcewatch or a well informed comment on this page. This video contains the Speeches from the pro-war rally. With anger and threats they proclaim that the troops can only be supported with blind-faith in the administration. To them appropriating our memorial of peace bolsters their self-righteous belief that their way is the true American way. Download or link to video of speeches. ‘Crowds gather to denounce, support war Veterans, some from the Rolling Thunder motorcycle group, lined up at the Vietnam Veterans Memorial. "I'm not sure I'm in support of the war," said William "Skip" Publicover of Charleston, South Carolina, who was a swift boat gunner in Vietnam and lost two friends whose names are etched on the memorial's wall. Rolling Thunder, at least the leadership and many who aren't Vets are running with the so called 'Move America Forward' group. I won't go into the History of 'Rolling Thunder' except to say that Many of the Real'Nam Veterans held this as a Great Tradition, once started, till they figured out the extreme right swing of the leadership and that many allowed to join weren't veterans. Some still participate but stay clear of using 'The Wall' or any other Memorial as a Political Statement! Will also add that some of those, who are 'Nam Vets, and run with these groups, like this 'Move America Forward' were in Total Opposition of even having 'The Wall' Built!! 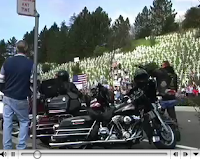 Download or link to video of bikers.